Nothing to report that deserves a whole entry, just scraps and left-overs. 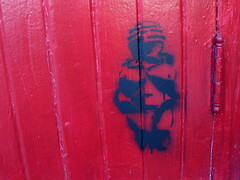 -Someone has been tagging the neighbourhood with stencils of the Venus of Willendorf! I think it's pretty cool, but I am very keen on Upper Paleolithic art (moreso than most people). I should really write something here about the UP one day... It's just so mind-bogglingly interesting, where do you start? -It would appear that the Olympics are on. More than anything, this serves to remind me that it was four years since I was living in Japan. It's kind of interesting to compare what sports get hyped up in different countries. I remember quite clearly the blanket coverage of speed skating, ski jumping and freestyle skiing. Meanwhile, here in Canada, it's hockeyhockeyhockeyhockeyhockey with the rest of the events being aired as filler between hockey stories. Okay, actually, I haven't been watching very much of it so far so I could be wrong. I used to love the Olympics but now I don't care. Still, when you encounter an event in progress on TV, it's very hard to turn it off, isn't it? I found myself watching an hour of men's downhill today, for no reason. The sports fan in me will probably tune in intentionally only to watch the curling. The girly-girl in me might watch men's speed skating (oh goodness, those legs!). -My Karma Konfabulator for today was surprisingly accurate: "You've spent quite a bit of time alone lately, and in addition to missing you, your friends are beginning to worry. The good news is that this hibernation thing is about to come to an end. The Full Moon tonight will urge you to get out there and mingle." So, to the ones who have been worried, don't be! I've been staying in because it's cold and I just want to be cozy inside with a mug of tea and my knitting! It's nothing personal. I'll be suffering from cabin fever soon enough and I'll re-emerge. 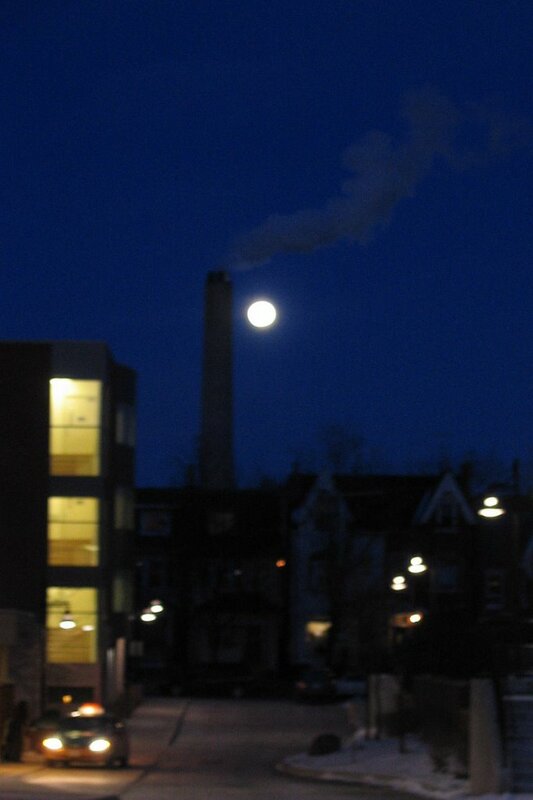 -Speaking of the full moon, I tried to get arty with it tonight in that photo to the left, but I just couldn't get it right. Recently, I've been feeling really limited by my camera. I only got it a year or so ago and I was crazy about it then. But more and more often, I've found that it really doesn't capture scenes with the sharpness or detail that I want. Maybe I'm just expecting too much for a starter digital camera. Yes, I have a very nice film SLR, but I can't really carry that in my handbag at all times, can I? -A couple of weeks ago, Vince and I tried out a little noodle shop slash sushi bar in Chinatown, just a couple of minutes from my apartment. They do a pretty convincing tonkotsu ramen, which I had a craving for today. It was before the dinner rush and I was just slurping up the last of the broth when I heard the hissing sound of an aerosol spray coming from the kitchen along with the clatter of metal pots hitting the floor. A minute later, I overheard one of the sushi bar guys giving the other a little English lesson.